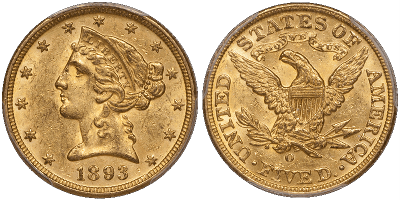 Gold $5 Liberty Half Eagles were clearly a favorite among our readers last week. If you missed out on those extraordinary coins, or you were looking for something that is truly rare, now is your chance to take advantage of $5 Liberties that are some of the finest in their grade. As you may have read last Tuesday, the $5 Half Eagle was a mainstay in American and global commerce for over a century. 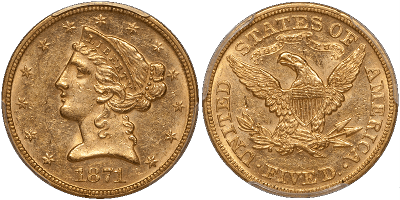 It was one of the very first gold coins ever released by the United States Mint in 1795 – and remained in production until 1929. The Liberty Head design was struck from 1839 through 1907, with the only noticeable modification of the “IN GOD WE TRUST” motto added in 1866. In the United States, it was one of the coins most likely to be spent by individuals and played a central role in everyday life. Our rare U.S. coin expert, Doug Winter, has hand-selected a diverse and desirable group of rare $5 Liberty Half Eagles in a variety of grades and price ranges exclusively for ASI readers. These coins are outstanding values and can offer excellent long-term performance as a result of their quality, rarity and collectability. All of the coins below are amongst the rarest of the $5 Liberty Half Eagles. For more information, click on each coin to learn more about their unique stories. If you are ready to add one of these rare, $5 Liberty Half Eagles to your collection or investment portfolio, call us at 800-831-0007 or send us an email. 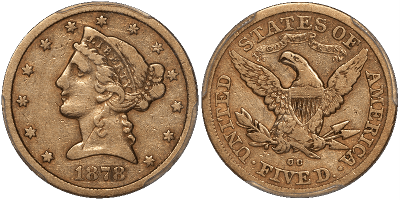 A strong case can be made for calling the 1862-S the third rarest San Francisco Half Eagle after the 1854-S and the 1864-S. Around 50-60 coins are known from a mintage of 9,500 and this is a solid R-7 in AU grades with fewer than 10 known. Two exist in Uncirculated: a PCGS MS61 and an MS62 from this service. This is a solid coin for the grade, with good overall detail and warm natural light orange-gold color which is "right" for a San Francisco gold coin of this era. There are scuffs consistent with the grade on both sides and a few dirt spots on the reverse, including one on the lower half of the mintmark. The present example is the only PCGS AU50 1862-S Half Eagle to sell at auction since 2005. An NGC AU53 sold for $15,275 in Heritage's March 2014 and it had a detracting cut on Liberty's face. This date is only the third piece that Doug has found in the last three years. With a comparatively high mintage of 52,000 coins, the 1868-S Half Eagle should be a fairly available issue, but it has a tiny survival rate and just 150 or so exist. In properly graded AU58, it is doubtful if more than four or five exist and Doug is aware of just two in Uncirculated: an NGC MS61, and a similarly graded PCGS example. This very pleasing borderline Uncirculated piece shows little--if any--actual wear and has a considerable amount of mint luster remaining beneath natural rose and light orange-gold color. Some ticks can be seen in the left obverse field but these are not deep or detracting. The overall level of eye appeal is superior for the date and grade. Another NGC/CAC AU58 1868-S sold for $5,463 at a Heritage auction. This unimprovable coin represents solid value in the “With Motto” San Francisco half eagle series. CAC has approved 2 in this grade with none finer. The 1871 Half Eagle has a tiny mintage of just 3,200 business strikes. Well under 100 coins are known and the vast majority are in the EF40 to AU53 range. There are just three Uncirculated 1871 Half Eagles, all of which grade MS61. This exceptional coin is significant for a variety of reasons. The first is that it shows natural color and it hasn’t been scrubbed (as have so many examples of this date). 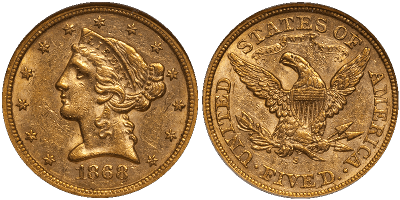 Secondly, its semi-prooflike surfaces aren’t decimated by deep abrasions as are most 1871 Half Eagles. Finally, unlike many gold coins graded MS61, this piece has real eye appeal and lacks visible wear on the high spots. The most recent auction records for this date in PCGS is $15,275. Another PCGS MS61 is in a prominent New Jersey collection of Half Eagles and it was purchased by Doug by private treaty a few years ago. 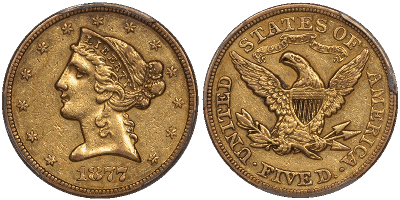 Coins of this sort were largely ignored up until five or so years ago, but the demand for truly rare, high-grade Philadelphia and San Francisco Half Eagles (not to mention quarter eagles and eagles) from the Reconstruction Era has increased immeasurably. This issue has a microscopic mintage of 1,132 business strikes and it is likely that as few as 60-70 coins are known. 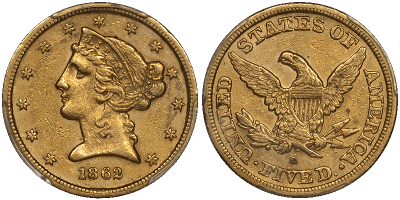 The 1877 Half Eagle seems to not have seen extensive circulation as more are known in AU grades than in EF, but it is extremely rare in Uncirculated with just three or four known, all in the MS60 to MS62 range. This piece seems to have AU sharpness but it has been conservatively graded as a result of the usual scattered marks in the surfaces. The color is a deep lime-gold with plenty of dirt hiding in the protected areas. A PCGS EF45 example of this date has not sold at auction since 2005. Only the ultra-rare 1875 has a low mintage figure amongst Philadelphia Liberty Head Half Eagles and in my opinion, the 1877 is a very under-appreciated issue. Rare Collector Grade 1878-CC Half Eagle The 1878-CC is the third rarest CC half eagle after the 1870-CC and the 1873-CC. Around 100 coins are known from the mintage of 9,054 and many are well-worn or show extensive cleaning. This date is missing from most sets of Carson City Half Eagles; both in lower grades and in higher grades. This is a full VF30 which has been slightly net-graded down to a VF25 due to an old, hidden scratch on Liberty's neck. The color is a natural russet hue and the naked-eye appearance is excellent both for the date and for the grade. Only two VF25 1878-CC half eagles have sold at auction since 2004 and this exact piece realized $4,465 (in a PCGS VF25 holder) at a Heritage auction. This is the best available quality for this rare issue at less than $6,000. 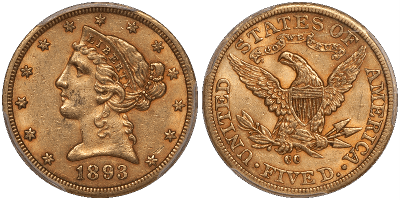 The 1892-CC Half Eagle is not often seen above the MS60 to MS62 grades and even less with natural color and choice surfaces. This fresh-to-the-market example was recently repatriated from Europe and it is notable for its unadulterated, lightly abraded surfaces. If you like "dirty gold" you will really like this coin. No PCGS/CAC MS61 1892-CC Half Eagles have recently sold at auction. An NGC MS61 with CAC approval brought $2,511 at a Heritage auction. This is a perfect Carson City type coin for a collector looking for a nice Half Eagle from this facility who eschews the common 1891-CC. CAC has approved 10 in this grade with 12 higher. The 1893-CC is numismatically significant as the final Half Eagle from the Carson City mint. It isn’t scarce in the higher AU grades, but most of the pieces in 58 holders are bright and unoriginal. This choice slider was recently located in Europe and it shows deep, even russet color with reddish flashes at the edges. The surfaces are choice and there is light wear confined to the obverse high spots. Only three PCGS AU58 1893-CC Half Eagles have sold at auction since June 2015 and none were approved by CAC. The last APR is $2,350 set by Heritage. The 1893-O is the most available of the three “With Motto” Half Eagles from New Orleans. It is available in the lowest Uncirculated grades but properly graded MS62 pieces are scarce and this issue is rare in MS63 and above. 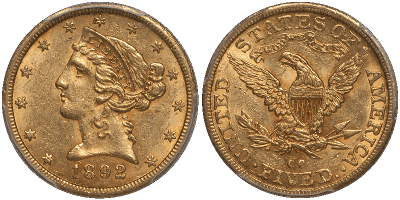 This choice, frosty orange-gold example was recently found in Europe and it shows less dark color on the highlights than other 1893-O Half Eagles from this source. No CAC approved PCGS MS62 has ever sold at auction. The only APR since 2013 is $2,585 set by Stacks Bowers. Doug has seen inferior examples of this date in MS63 holders. CAC has approved 10 in MS62 with 3 finer. *Prices are subject to change based on market fluctuation and availability. Prices reflected are for wire transfer, check, or cash only. Offer expires May 26, 2017.